(Francisco Kjolseth | The Salt Lake Tribune) John Curtis, Republican candidate for 3rd Congressional District awaits election results alongside his wife Sue during his election night watch party at the Provo Marriott Hotel & Conference Center Tuesday, Nov. 7, 2017. The winner of the November special election will fill the congressional seat recently vacated by Jason Chaffetz. (Francisco Kjolseth | The Salt Lake Tribune) John Curtis, Republican candidate for 3rd Congressional District awaits election results as he meets with supporters during his election night watch party at the Provo Marriott Hotel & Conference Center Tuesday, Nov. 7, 2017. The winner of the November special election will fill the congressional seat recently vacated by Jason Chaffetz. (Francisco Kjolseth | The Salt Lake Tribune) John Curtis, Republican candidate for the 3rd Congressional District, awaits election results as he meets with supporters during his election night watch party at the Provo Marriott Hotel & Conference Center Tuesday, Nov. 7, 2017. Curtis was declared the winner soon after polls closed and will fill the congressional seat recently vacated by Rep. Jason Chaffetz. (Francisco Kjolseth | The Salt Lake Tribune) Buttons greet supporters as John Curtis, Republican candidate for 3rd Congressional District awaits election results as he meets with supporters during his election night watch party at the Provo Marriott Hotel & Conference Center Tuesday, Nov. 7, 2017. The winner of the November special election will fill the congressional seat recently vacated by Jason Chaffetz. (Francisco Kjolseth | The Salt Lake Tribune) Provo mayoral candidate Sherrie Hall Everett speaks on the phone during election night at the Provo Marriott Hotel & Conference Center Tuesday, Nov. 7, 2017. (Francisco Kjolseth | The Salt Lake Tribune) State Auditor John Dougall and Provo mayoral candidate Sherrie Hall Everett see the first election results trickle in at the Provo Marriott Hotel & Conference Center Tuesday, Nov. 7, 2017. 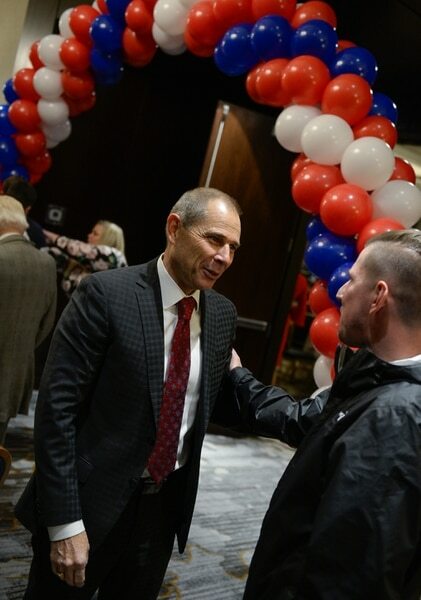 (Francisco Kjolseth | The Salt Lake Tribune) Rep. Mike Winder, R-West Valley City, greets John Curtis, Republican candidate for 3rd Congressional District, as he awaits election results with supporters during his election night watch party at the Provo Marriott Hotel & Conference Center Tuesday, Nov. 7, 2017. Curtis was declared winner of the special election to fill the congressional seat recently vacated by Rep. Jason Chaffetz. (Francisco Kjolseth | The Salt Lake Tribune) Supporters of John Curtis, Republican candidate for 3rd Congressional District, join the watch party awaiting election results at the Provo Marriott Hotel & Conference Center Tuesday, Nov. 7, 2017. The winner of the November special election will fill the congressional seat recently vacated by Jason Chaffetz. (Francisco Kjolseth | The Salt Lake Tribune) State Auditor John Dougall, Provo mayoral candidate Sherrie Hall Everett and Rep. Mike Winder, R- West Valley, from left, check on election results at the Provo Marriott Hotel & Conference Center Tuesday, Nov. 7, 2017. (Francisco Kjolseth | The Salt Lake Tribune) John Curtis, Republican candidate for 3rd Congressional District, celebrates his win at the Provo Marriott Hotel & Conference Center Tuesday, Nov. 7, 2017. He will fill the congressional seat recently vacated by Jason Chaffetz. 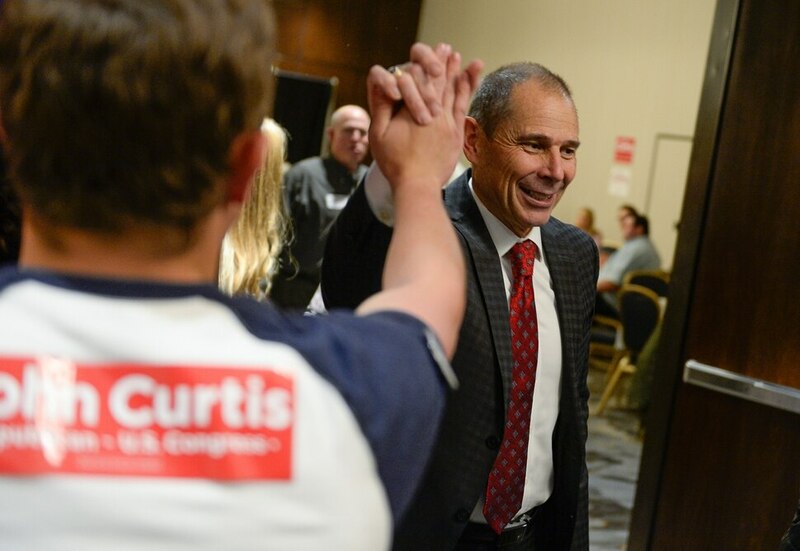 (Francisco Kjolseth | The Salt Lake Tribune) John Curtis, Republican candidate for 3rd Congressional District celebrates his win at the Provo Marriott Hotel & Conference Center Tuesday, Nov. 7, 2017. He will fill the congressional seat recently vacated by Jason Chaffetz. (Francisco Kjolseth | The Salt Lake Tribune) John Curtis, Republican candidate for 3rd Congressional District celebrates his win at the Provo Marriott Hotel & Conference Center Tuesday, Nov. 7, 2017. He will fill the congressional seat recently vacated by Jason Chaffetz. (Francisco Kjolseth | The Salt Lake Tribune) John Curtis, Republican candidate for 3rd Congressional District celebrates his win at the Provo Marriott Hotel & Conference Center Tuesday, Nov. 7, 2017. He will fill the congressional seat recently vacated by Jason Chaffetz. (Francisco Kjolseth | The Salt Lake Tribune) John Curtis, Republican candidate for 3rd Congressional District celebrates his win at the Provo Marriott Hotel & Conference Center Tuesday, Nov. 7, 2017. He will fill the congressional seat recently vacated by Jason Chaffetz. (Francisco Kjolseth | The Salt Lake Tribune) John Curtis, Republican candidate for 3rd Congressional District celebrates his win at the Provo Marriott Hotel & Conference Center Tuesday, Nov. 7, 2017. He will fill the congressional seat recently vacated by Jason Chaffetz. (Francisco Kjolseth | The Salt Lake Tribune) John Curtis, Republican candidate for 3rd Congressional District celebrates his win at the Provo Marriott Hotel & Conference Center Tuesday, Nov. 7, 2017. He will fill the congressional seat recently vacated by Jason Chaffetz. (Francisco Kjolseth | The Salt Lake Tribune) John Curtis, Republican candidate for 3rd Congressional District celebrates his win at the Provo Marriott Hotel & Conference Center Tuesday, Nov. 7, 2017. He will fill the congressional seat recently vacated by Jason Chaffetz. (Francisco Kjolseth | The Salt Lake Tribune) John Curtis, Republican candidate for 3rd Congressional District celebrates his win at the Provo Marriott Hotel & Conference Center Tuesday, Nov. 7, 2017. He will fill the congressional seat recently vacated by Jason Chaffetz. (Francisco Kjolseth | The Salt Lake Tribune) John Curtis, Republican candidate for 3rd Congressional District celebrates his win at the Provo Marriott Hotel & Conference Center Tuesday, Nov. 7, 2017. The winner of the November special election will fill the congressional seat recently vacated by Jason Chaffetz. (Francisco Kjolseth | The Salt Lake Tribune) John Curtis, Republican candidate for 3rd Congressional District celebrates his win at the Provo Marriott Hotel & Conference Center Tuesday, Nov. 7, 2017. The winner of the November special election will fill the congressional seat recently vacated by Jason Chaffetz. (Francisco Kjolseth | The Salt Lake Tribune) John Curtis, Republican candidate for 3rd Congressional District celebrates his win at the Provo Marriott Hotel & Conference Center Tuesday, Nov. 7, 2017. The winner of the November special election will fill the congressional seat recently vacated by Jason Chaffetz. (Francisco Kjolseth | The Salt Lake Tribune) John Curtis, Republican candidate for 3rd Congressional District celebrates his win at the Provo Marriott Hotel & Conference Center Tuesday, Nov. 7, 2017. The winner of the November special election will fill the congressional seat recently vacated by Jason Chaffetz. (Francisco Kjolseth | The Salt Lake Tribune) Sue Curtis watches her husband John Curtis give his acceptance speech as Republican candidate for 3rd Congressional District celebrates at the Provo Marriott Hotel & Conference Center Tuesday, Nov. 7, 2017. (Francisco Kjolseth | The Salt Lake Tribune) John Curtis, Republican candidate for 3rd Congressional District celebrates his win at the Provo Marriott Hotel & Conference Center Tuesday, Nov. 7, 2017. The winner of the November special election will fill the congressional seat recently vacated by Jason Chaffetz. (Francisco Kjolseth | The Salt Lake Tribune) John Curtis, Republican candidate for 3rd Congressional District celebrates his win at the Provo Marriott Hotel & Conference Center Tuesday, Nov. 7, 2017. The winner of the November special election will fill the congressional seat recently vacated by Jason Chaffetz. (Francisco Kjolseth | The Salt Lake Tribune) Lt. Governor Spencer Cox is joined by his wife Abby as they introduce John Curtis for congress during celebrations at the Provo Marriott Hotel & Conference Center Tuesday, Nov. 7, 2017. (Francisco Kjolseth | The Salt Lake Tribune) Candice Jewkes is joined by her daughter Annabelle, 5, as they await the arrival of newly appointed congressman John Curtis during his celebration party at the Provo Marriott Hotel & Conference Center Tuesday, Nov. 7, 2017. (Francisco Kjolseth | The Salt Lake Tribune) John Curtis, Republican candidate for 3rd Congressional District celebrates his win at the Provo Marriott Hotel & Conference Center Tuesday, Nov. 7, 2017. Curtis will fill the congressional seat recently vacated by Jason Chaffetz. (Francisco Kjolseth | The Salt Lake Tribune) John Curtis, Republican candidate for 3rd Congressional District celebrates his win at the Provo Marriott Hotel & Conference Center Tuesday, Nov. 7, 2017. Curtis will fill the congressional seat recently vacated by Jason Chaffetz. 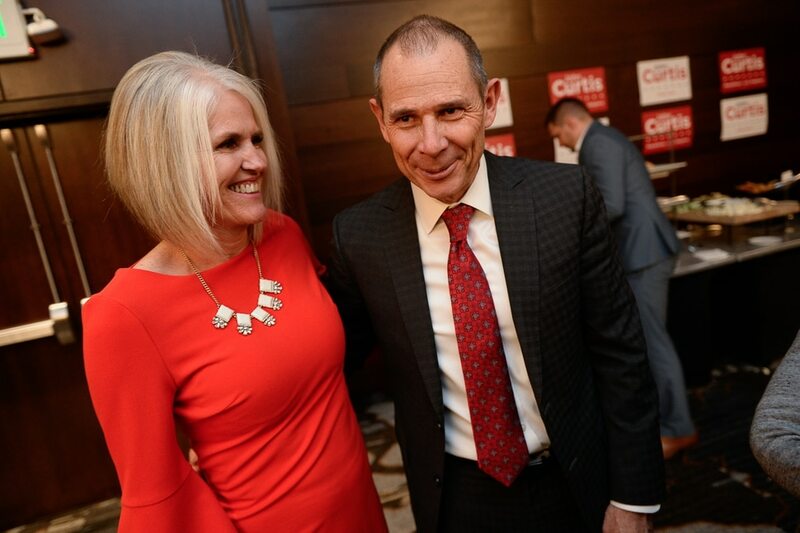 With a lofty lead, a big grin and a pair of American-flag-printed socks, Provo Mayor John Curtis, a moderate Republican, celebrated his win Tuesday night to become Utah’s newest congressman. Curtis trounced an astonishingly well-funded Democrat and a surprise third-party newcomer in the special election. He will serve the final year of former Rep. Jason Chaffetz’s term after the congressman unexpectedly stepped down in June and joined Fox News as a contributor. The Associated Press called the race within an hour of polls closing as Curtis — with nearly 58 percent of the vote — held onto a roughly 30 percentage point margin ahead of his nearest competitor, Democrat Kathie Allen. The National Republican Congressional Committee rushed to congratulate the mayor for his “top-notch campaign.” And Utah Lt. Gov. Spencer Cox stood by Curtis’ side as he announced his triumph. Even in Salt Lake County, where Democrats are expected to do their best, Curtis had a narrow advantage over Allen, according to unofficial results as of 10 p.m. And he’s so far picked up more than five times the votes in Utah County, which includes about 60 percent of the registered Republicans in the 3rd Congressional District. The new United Utah Party’s Jim Bennett, son of the late three-term Sen. Bob Bennett, came in third at just under 9 percent and was quick to concede. Minutes later, Allen, too, called Curtis to offer her congratulations and advice. ”[I] told him I hope he has the courage to stand up to Donald Trump,” she said of her phone call with the mayor. 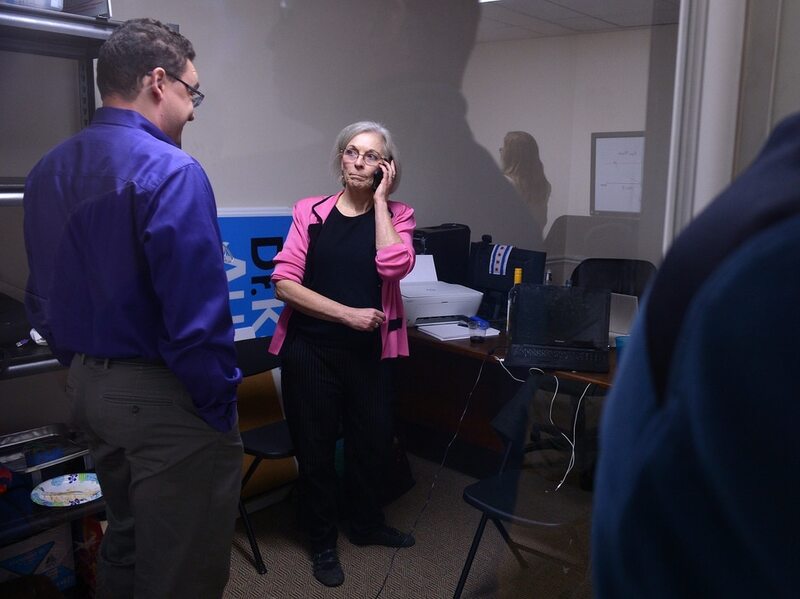 (Leah Hogsten | The Salt Lake Tribune) Utah's 3rd Congressional District Democratic candidate Kathie Allen concedes the race to Republican John Curtis at her election night headquarters November 7, 2017 in Holladay. Allen faced Curtis and the new United Utah Party's Jim Bennett, as well as a handful of independent and third-party candidates in Tuesday, Nov. 7 special election after former Rep. Jason Chaffetz vacated his seat. 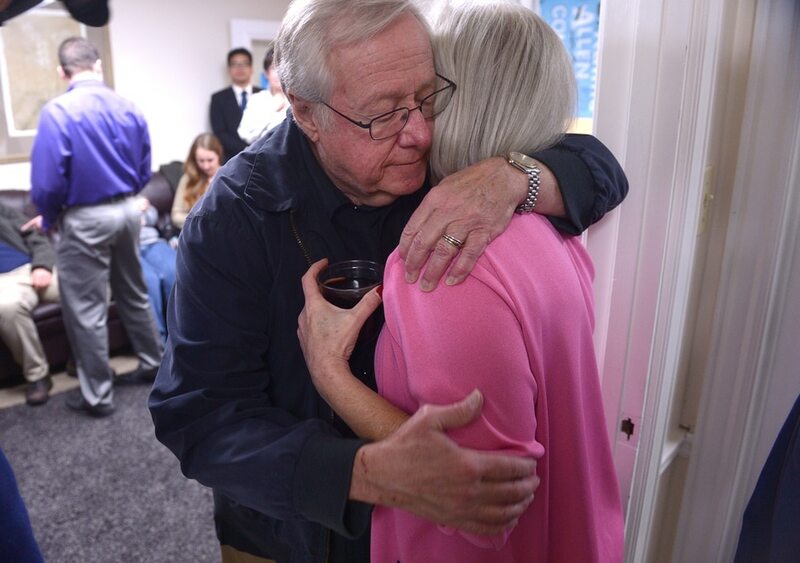 (Leah Hogsten | The Salt Lake Tribune) Utah's 3rd Congressional District Democratic candidate Dr. Kathie Allen gets a big hug from her husband Craig Fineshriber after she conceded the race at her election night headquarters November 7, 2017 in Holladay. Allen faced faced Republican Provo Mayor John Curtis and the new United Utah Party’s Jim Bennett, as well as a handful of independent and third-party candidates in Tuesday, Nov. 7 special election after former Rep. Jason Chaffetz vacated his 3rseat. (Leah Hogsten | The Salt Lake Tribune) I'm going to go back to gerrymandering work, said Utah's 3rd Congressional District Democratic candidate Kathie Allen after conceding the race, drawing laughter and applause at her election night party headquarters November 7, 2017 in Holladay. Allen faced faced Republican Provo Mayor John Curtis and the new United Utah Party’s Jim Bennett, as well as a handful of independent and third-party candidates in Tuesday, Nov. 7 special election after former Rep. Jason Chaffetz vacated the seat. (Leah Hogsten | The Salt Lake Tribune) l-r Kathie Allen's election team Ken Peterson, Hannah Kuhnhausen and Ingela Rundquist were elated with Salt Lake County's poll results, and relay the news to a stunned Allen, who had just entered party headquarters November 7, 2017 in Holladay. Allen lost to Republican Provo Mayor John Curtis in the special election after former Rep. Jason Chaffetz vacated his 3rd Congressional District seat. (Leah Hogsten | The Salt Lake Tribune) President Donald Trump delivers his speech to the South Korean National Assembly as election staff await the arrival of Utah's 3rd Congressional District Democratic candidate Kathie Allen at Allen's election night party headquarters in Holladay. Allen faced faced Republican Provo Mayor John Curtis and the new United Utah Party's Jim Bennett, as well as a handful of independent and third-party candidates in Tuesday, Nov. 7 special election after former Rep. Jason Chaffetz vacated his the seat. (Leah Hogsten | The Salt Lake Tribune) Otter Creek guitarist Peter Danzig plays a song at Utah's Third Congressional District's democrat candidate Dr. Kathie Allen election night party headquarters in Holladay. Allen faced faced Republican Provo Mayor John Curtis and the new United Utah PartyÕs Jim Bennett, as well as a handful of independent and third-party candidates in Tuesday, Nov. 7 special election after former Rep. Jason ChaffetzÕs vacated his Third Congressional District seat. (Leah Hogsten | The Salt Lake Tribune) Otter Creek guitarist Peter Danzig plays a song at Utah's Third Congressional District's democrat candidate Dr. Kathie Allen election night party headquarters in Holladay. Allen faced faced Republican Provo Mayor John Curtis and the new United Utah Party’s Jim Bennett, as well as a handful of independent and third-party candidates in Tuesday, Nov. 7 special election after former Rep. Jason Chaffetz’s vacated his Third Congressional District seat. (Leah Hogsten | The Salt Lake Tribune) Utah's Third Congressional District's democrat candidate Dr. Kathie Allen gets a hug from her campaign manager Emily Bingham, left, and applause from her husband, Craig Fineshriber, right, and supporters as she addresses her election staff November 7, 2017 in Holladay after conceding the race to John Curtis. Allen faced faced Republican Provo Mayor John Curtis and the new United Utah PartyÕs Jim Bennett, as well as a handful of independent and third-party candidates in Tuesday, Nov. 7 special election after former Rep. Jason ChaffetzÕs vacated his Third Congressional District seat. 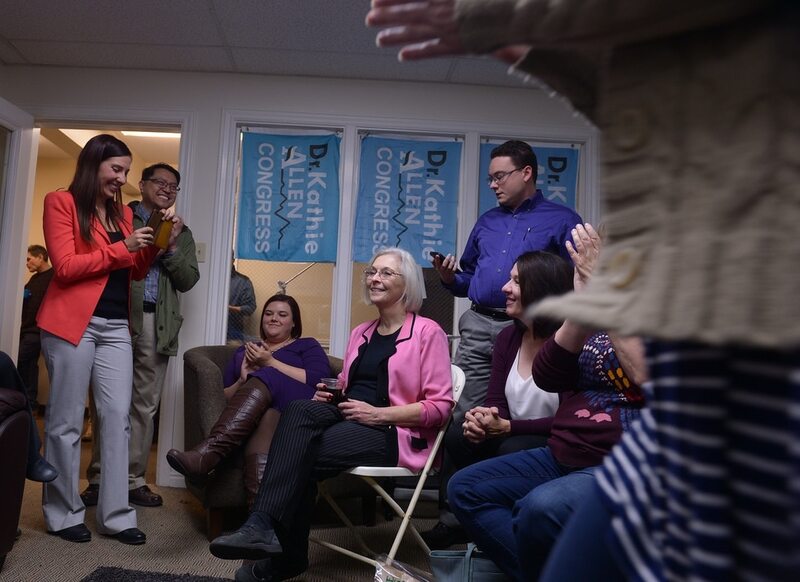 (Leah Hogsten | The Salt Lake Tribune) Utah's Third Congressional District's democrat candidate Dr. Kathie Allen thanks her election staff at party headquarters November 7, 2017 in Holladay after conceding the race to John Curtis. Allen faced faced Republican Provo Mayor John Curtis and the new United Utah PartyÕs Jim Bennett, as well as a handful of independent and third-party candidates in Tuesday, Nov. 7 special election after former Rep. Jason ChaffetzÕs vacated his Third Congressional District seat. Allen, a longtime physician and first-time candidate, ran an unprecedented and well-financed campaign, raking in more than $800,000 in the strongly GOP-tilted district. With tears in her eyes, she said there were no regrets but worried about disappointing the people who supported her since she launched her bid in March to oust Chaffetz. She also slammed the lack of support she got from the national Democratic Party. Allen plans to return to her job serving Utah Transit Authority staff at a private clinic and intends to continue her efforts to reform the partisan way the state’s congressional boundaries are drawn. At the Curtis party, it was all smiles and cheers beginning with the earliest results of the evening at 8 p.m. that put the mayor ahead and rivaled his leads in every poll prior to the election. He could be sworn in as early as Monday, Cox said, to join Utah’s all-GOP federal delegation. The race had been largely consumed by discussion of President Donald Trump, who has overwhelmed all political topics for the past year including dominating every debate for the open 3rd District seat. “A lot of people are wanting me to be Trump-like, and I’m not going to be,” he has said. Curtis ran a shooting range business in Provo before serving two terms as mayor of the state’s third largest city and one of the most conservative in the nation. After winning a gritty three-way Republican primary in August where he was criticized for not being conservative enough (and for once being a Democrat some 20 years ago), Curtis faced pushback during the general election for using the president’s slogans, such as “drain the swamp,” in campaign advertising and removing a post on Facebook exhorting Congress to “build the wall” between the United States and Mexico. Still, he’s considered a moderate candidate, launching his bid by collecting voter signatures instead of relying on ultraconservative GOP convention delegates. During the campaign, he captured support from Utah Gov. Gary Herbert, former Republican presidential nominee Mitt Romney, U.S. House Majority Leader Kevin McCarthy and Chaffetz. House Speaker Paul Ryan congratulated Curtis on Tuesday, saying he will be a “valuable addition” to the Republican conference currently looking to advance tax reform. Mary Swenson, of Cottonwood Heights, did not vote for Trump last year but cast her ballot for Curtis on Tuesday calling him the “more middle-of-the-road” choice. “What I really want is someone who can see beyond party lines,” she added. Sue Villani, a Cottonwood Heights resident the same as Allen, voted for the doctor while suggesting “this is a godawful place for progressives.” Ahren Exeter also cast her ballot for Allen, saying Trump played a big part in the decision. Bennett was a Republican but left the party when Trump was nominated in the 2016 presidential race. He’s billed himself as an “honest broker” between the two major parties. He anticipated running in 2018, but launched a bid after Chaffetz’ early departure turned what would have been a municipal primary only into a complicated congressional special election — the first in Utah in 90 years. The other third-party and independent candidates, including Libertarian Joe Buchman, collected less than 7 percent of the vote. The 3rd Congressional District, where registered Republican voters outnumber Democrats nearly six to one, stretches from central Salt Lake County to the southernmost border of San Juan County. Curtis, standing in front of an American flag, highlighted that landscape and promised to represent the more than 700,000 constituents within. -Tribune reporters Taylor W. Anderson and Jennifer Dobner contributed to this story.